You are here: Home / lunch / Egg Drop Soup! So, at the very beginning of this past holiday season…I’m talking Thanksgiving week…I managed to get myself the world’s most energetic case of strep throat, with a large economy sized cold on top of it. I was the perfect storm of misery, right smack in the middle of crazy running around cooking/wrapping/decorating time. And I fervently believe that the thing that saved me (along with a whopping course of antibiotics) was that the Southern husband kept feeding me warm, soothing, delicious-even-with-a-sore-throat bowls of egg drop soup. Bowl after bowl after bowl of it. And after I made it out the other side I thought to myself, I really need to come up with my own version of this slightly spicy, slightly creamy, totally wonderful soup. And as it turned out, not only is egg drop soup the cure for what ails you, it’s also something that you can whip up in about 10 minutes. Ten minutes! It just keeps getting better and better. Now while I was deliriously happy with my egg drop soup exactly as it was, we happened to be at Trader Joe’s at one point, and they had some adorable little frozen shrimp dumplings – fully cooked and just needing to be microwaved. So I microwaved a few and dropped them into my egg drop soup…and just when I thought it couldn’t get any better? It got better. So while I hope you never ever get a sore throat of your own, if you do…egg drop soup. 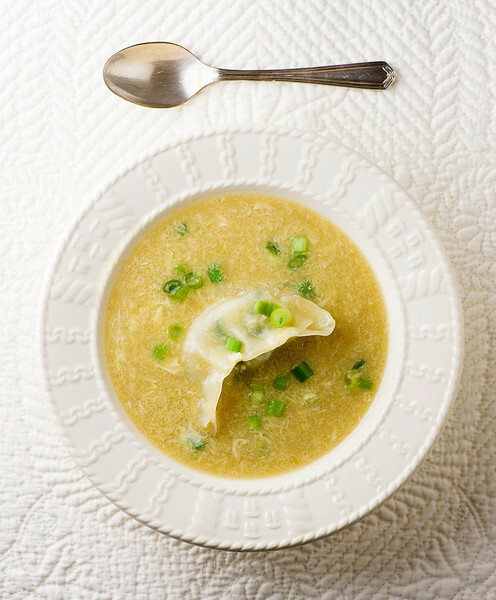 And if you don’t…egg drop soup anyway! Put chicken broth, soy sauce and ginger in a medium saucepan and bring to a boil. Whisk in cornstarch mixture and stir until slightly thickened. Turn heat down to low. Pour in beaten egg and whisk gently for about a minute…the egg will separate a little into strands as it cooks. Season to taste with salt and pepper. If you have dumplings on hand, this is the time to add them in. Garnish with scallions. Serve at once. Oh, that looks and sounds delicious! Perfect for a cold, drab and dreary rainy day here in the top of Texas. Always look fwd. to new posts from you in my reader! Thanks Mike! And the soup works great here in wintry NJ too – it’s on my menu (again) this weekend! Wow, who knew it would be that easy! I love egg drop soup but always figured it would be pretty complicated to actually make at home. Now I can skip the Pho take-out when I am sick and just make this. Gonna whip up a batch to take to work… sounds great! I’ve always wondered how to make egg drop soup. Who knew it was so easy! Almost everyone I know is sick so I should make a big batch of it and just distribute it. I know, it is just CRAZY out there. Stay well. Just what I was looking for and I am not ill!!! I can’t wait to try this. My mom used to make the greek verision of this with eggs, lemon and orzo. Now I can be armed with two and ready for this season. EVERYONE around me is sick and I am hoping it misses me..I am almost tempted to wear garlic around my neck (almost!). Yum orzo – that would be a perfect addition to this soup! Stay well, Winnie! This is my husband’s fav soup ever! I didnt realize how simple it could be, thanks for the recipe, we are in the dead of winter here in Boston! You are a girl after my own heart…I’m a soup every day person too! Oh my goodness, the process is so simple, I think I’m in love! Thank you! Isn’t it great when the simple things are also the best? Yay! wow, that definitely brought me back…I’ve definitely had my share of those raman noodles back in the day! I am making this for my sick daughter (6) tonight. Any idea how this will keep in the fridge? Her appetite isn’t quite there to eat a whole lot at once. Thanks! Oh no – I hope your bunny is better soon! This will keep a day or two in the fridge – just reheat it slowly. You can also cut the recipe down proportionally to do it one egg at a time so you can make it fresh in batches. Feel better – I know sick little ones make the mama feel bad too.